A friend once pointed out to me that the world has few naturally blue foods. Though I can’t vouch for my friend’s explanation for this fact — that blue in nature often signals or implies poison, which causes an evolutionary aversion to eating things this color — I have to agree with the first claim: Aside from some horrifically rotten things I ate during my long, cold, “Frank McCourt” days, I can’t recall every eating something that was naturally, Crayola-starter-pack blue. Blueberries are often more purple, while blue corn actually looks more black. Fish skin can be blue, but it’s often also iridescent and therefore every other color. Besides, the skin isn’t ever the central source of nutrients with fish. And as I noted in a previous post on the crime against nature that is blue raspberry, the flavor has no counterpart sapphire-colored fruit growing on a vine anywhere. The problem of translating the concepts of green and blue into other languages that may not differentiate between them or may do so differently has given rise to a linguistic catch-all that also happens to be the word of the week. grue (GROO) — noun: a portmanteau of the words green and blue, used to describe the concept of these colors being viewed as variations of the same base color and therefore needing only one name. I have actually written before about how the way we Westerners break up the spectrum is arbitrary. In the post “How Roy G. Biv Ruined Everything,” I talked about why I hate indigo and how it didn’t deserve a shout-out in the spectrum any more than, say, turquoise or chartreuse or whatever you want to call the chunk of rainbow where red turns into orange. It’s the fault of that that dumbass Isaac Newton, in fact, as he wanted the colors of the spectrum to add up to that most heavenly of numbers, seven, instead of the clearly imperfect six. But aside from throwing off the color wheel and making complementary colors not show up across from each other, inserting indigo between blue and purple is no less logical than any other way of breaking up the spectrum. To illustrate this claim, I set up a five-color division of the spectrum using the nonsense words that don’t mean anything in any language. It would be different, but it would be just as valid as the old Roy G. Biv system. The Philippine language Ifugao and the Australian language Martu Wangka are unusual in that they both distinguish between green and blue but lump blue and black into the same category. 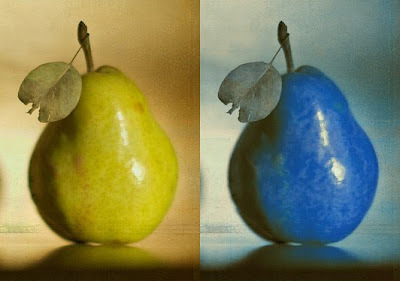 Russian use a seven-color spectrum that separates blue into lighter hues (голубой, or goluboy) and darker ones (синий, or siniy). And, finally, the word that led me to learn about grue in the first place: ao, Japanese for either “blue” or “green,” though it’s not as simple as just that. Japanese also has a separate word for green, midori, which should be familiar to people who know their way around a bar. (That is, they’d know to avoid the stuff.) But midori came into use much later than ao, and the latter retained some chromatic territory. For example, Wikipedia notes that ao is still used when describing vegetation or traffic lights, while other green-colored objects get midori. So that’s what I can offer you about grue. It kind of makes the English-speaker’s dilemma of “Is my new sweater turquoise, teal or aquamarine?” seem a little stupid. (And yet I go through that dilemma. Every. Day.) I normally end word-of-the-week post with a link back to all the previous words-of the-week, but this time I prefacing that link list with one of just color words, and I’ve done quite a few on this blog. Seriously, when it comes to good ol' Amerrikun coulours, "indigo"'s only rightful place is in the early Pokémon games. Might as well be part of "purple" ("violet"s are flowers and a pompous person's coulour). grue (GROO) — noun: The grue is a sinister, lurking presence in the dark places of the earth. Its favorite diet is adventurers, but its insatiable appetite is tempered by its fear of light. No grue has ever been seen by the light of day, and few have survived its fearsome jaws to tell the tale. Fitting, as the word was already taken to mean fear, something to fear, or a reaction to that fear. Obscure, perhaps, but I say it more often per day than this grue definition. I prefer Bleen. It sounds like pure 50s zeerust. Just because Vietnamese or Lakota Sioux use the same category for blue and green doesn't mean that Vietnames speakers or Lakota Sioux speakers would have trouble understanding the difference between blue and green. If they needed to I'm sure they could make the distinction, just like we can make the distinction between, say, light blue and dark blue. TJF: Agreed. Indigo has its place, but only among only tertiary colors. That's my spectrum, anyway. Ian: Yes, there's that sense too, and it's apparently used more often that I realized. Darren: I was aware of the philosophical uses of "grue" and "bleen," but I seem to have left them out from my little write-up. I'm more interested in the use of the word in linguistics, but I should have at least mention that Nelson Goodman is credited as having coined the word "grue." I would guess that it leaked into the world of linguistics after his initial use of it. Goofy: I understand what you're saying, but what I was trying to express with the example of Vietnamese and Sioux-speakers was that they simply might not be unable appreciate the curiosity that is the world's lack of blue-colored foods the way a color differentiator would. I feel like a differentiator who'd never been confronted with the fact that we generally lack blue foods would be a little surprised by it. I feel like a non-differentiator would not, simply because they'd respond with "Well, maybe there is a lack of [blue]-colored foot, strictly speaking, but there are so many [green]-colored foods and the two are basically the same thing, so that statement isn't exactly earth-shattering," with whatever they termed sky color and leaf color slipped into the appropriate slots. It's hard to explain, but it makes sense in my head. I guess it boils down to the fact that I'm interested in how language can shape people's perception to the point that it could render moot what I think is an interesting point of trivia. Of course, I meant "[blue]-colored FOOD," not "foot," but I guess a similar conversation could be had about feet, if the Vietnamese and Sioux were so inclined. And I'm skeptical of claims that language does shape people's perception to that extent. I'd say you're more likely to be eaten by a grue than the other way around. Unless the grue you're eating is growing on old bread or cheese, in which case it will probably still get the best of you eventually.